The 5th Naveen Kalakar, an international level individual talent search program for young artists from 7 styles of Indian classical dances besides Kathakali, Indian classical music and instrumental music was held at the Utkal Sangeet Mahavidyalay’s mini auditorium from 10th to 13th June 2011 by the Devdasi Nrutya Mandir in association with Samskritiki (an organization run by dance critic Shyamhari Chakra) as well as with the Department of Tourism and Culture, Govt of Orissa. Artistes from USA, London, Peru and many parts of the country participated for solo performance of Odissi, Kuchipudi, Kathak, Manipuri, Sattriya, Mohiniattam and Bharatanatyam. Young classical singers of Odissi and Hindustani classical music and instrumentalists of flute, tabla and mardal also performed solo. The festival was inaugurated by Mr. Ashok Kumar Tripathy, the Principal Secretary of Department of Tourism and Culture, Govt of Orissa and Sri Prafulla Samal, Hon'ble Minister of Tourism and Culture also graced the occasion as the Chief Guest on the evening of the concluding day. The total of 4 evenings from 10th to 13th was for senior level classical dancers and for 3 days from 11th to 13th, the morning session was for the junior level Odissi dancers only. The morning session of the inaugural day was for music session. Those who secured 70% marks on their performance are awarded with the title of Nruthya Jyoti, Sangeet Jyoti and Badya Jyoti. Prateeksha Kashi, the daughter of Kuchipudi guru Vyjayanthi Kashi from Bangalore was the Best Performer of the 5th Naveen Kalakar 2011. 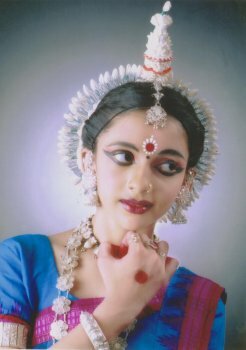 Sripunya Mohanty, a young Odissi dancer of Orissa Dance Academy, disciple of Guru Yudhisthir Nayak of Bhubaneswar, became topper among the junior level Odissi dancers.